I’m back. Yes, I’ve been gone for quite some time. The past months have been rather tumultuous; the main reason for the upheaval came from moving out of my old place and all that accompanies such a venture. But I wasn’t gone this whole time because of moving. In fact, that occupied a minimal part of my hiatus. How, then, could I justify being away for two months? Well, it’s been hot in California. When I was living in Seattle, I faced constant crisp, cool air (so unlike the regular warmth I grew up on) that became the perfect incentive to knit. I can thank Seattle for inspiring me to push the envelope on my knitting repertoire. I ventured away from my usual beanies and airy lace cowls and thought bigger, bulkier and most importantly, warmer. Out came wraps, gloves and sweaters. On the heels of completing my first sweater, I decided to make a cardigan, though my time in Seattle was running short. 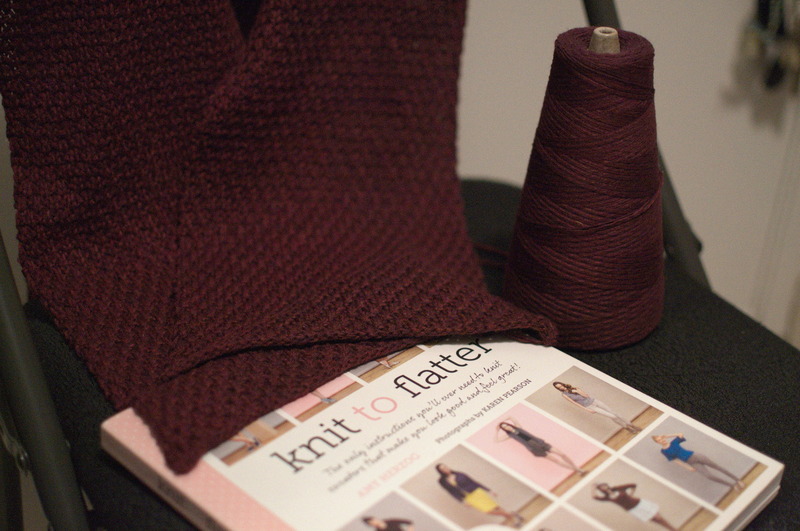 Armed with Amy Herzog’s “Knit To Flatter” and a cone of custom-blend yarn from Yarnia in Portland, I began. But by the time I shipped back to California, I’d only finished the back of my cardigan. That lonely back piece stayed in limbo for nearly a year as I found myself regularly sweating in Southern California again. I knit occasionally, working mostly on small projects like bows and headbands. After daylight saving time, I found myself shivering at my work desk, which sits under the air conditioning unit. It’s never particularly cold outside expect during early morning, but the blast of air conditioning when it’s not actually hot outside makes me reach for a jacket. My yarn basket was flung open again, and I started to sort my stash. I came across the barley touched cone from Yarnia, sitting atop the back of my unfinished cardigan. Then I knew where I’d get my warmth. It took just a few weeks to finish the remaining pieces. Everything has been blocked, and I’m just working through sewing everything together. Here’s a tiny peek at my progress. Hopefully I can show off the final project soon! Next on the list: a scarf for a friend who recently moved to Oklahoma. Hopefully I’ll find the time to make a heavy lace shawl for my grandma. And perhaps I can work in a few new pairs of socks. It’s amazing how inspiring the cold can be. Share your stories: What inspires you to break out of a crafting rut?